IRS Form 1098 or the "Mortgage Interest Statement" is tax form released and collected by the United States Internal Revenue Service. The January 1, 2018 fillable version of the 1098 Form can be downloaded below in PDF-format. 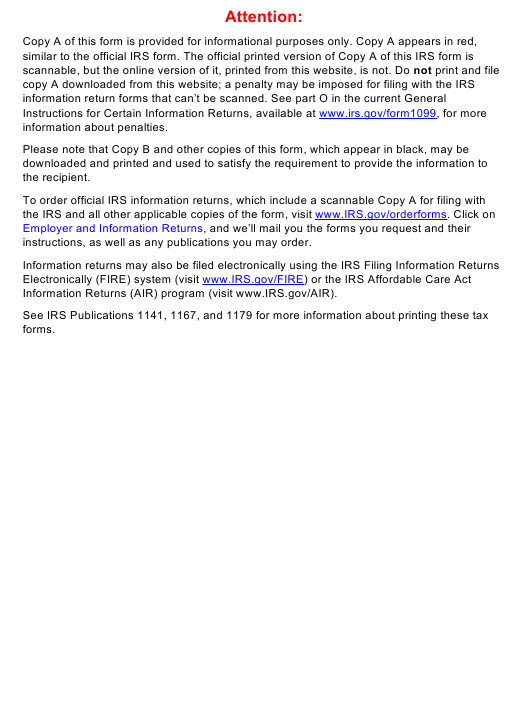 The "Mortgage Interest Statement" can be filed digitally and submitted online or printed out and sent to the IRS mailing address. province, country, ZIP or foreign postal code, and telephone no. the address or description in box 8.
not be fully deductible by you. the address or description is entered in box 8. Box 3. Shows the date of the mortgage origination. and Itemized Deduction Recoveries in Pub. 525.
borrower may have to include in income a share of any amount reported in box 4.
for more information, see Pub. 936 and Pub. 535.
this form may show only the last four digits of your TIN (SSN, ITIN, ATIN, or EIN). However, the issuer has reported your complete TIN to the IRS. Box 8. This is the address or description of the property securing the mortgage. such as real estate taxes or insurance paid from escrow. may be subject to a deduction limitation.